La Ferme du Lac Vert has 11 en-suite bedrooms made up as doubles, twins and triples to suit your need. We also manage the adjoining 'La Petite Ferme' a delightful three en-suite bedroom 'Mini Farmhouse' All bedrooms are exceptionally spacious and designed in a fusion of contemporary avec antique styles. We provide complimentary Cowshed toiletries, bathrobes and slippers. You also have a choice of feather or hollow fibre duvets and pillows. The architecture of the building provides stunning views of the surrounding mountains whilst the spatial and interior design offers luxurious comfort. 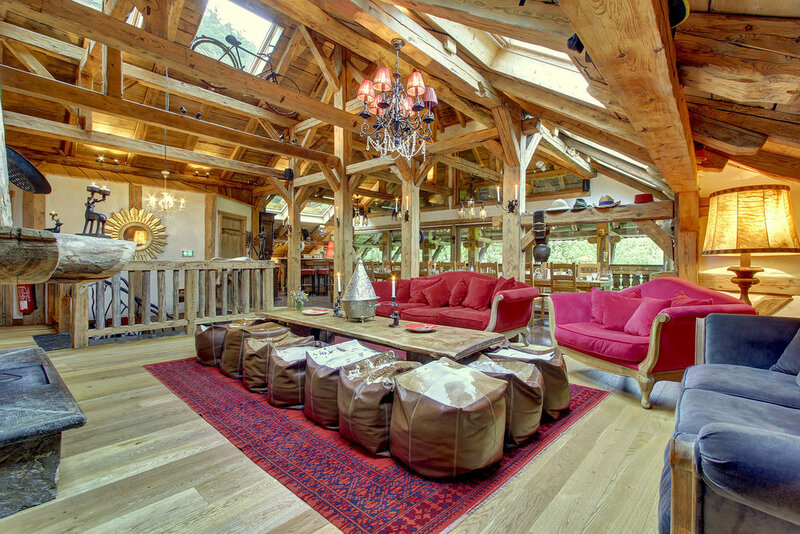 La Ferme Du Lac Vert is a boutique hotel / luxury ski chalet in Morzine, the heart of the French Alps. 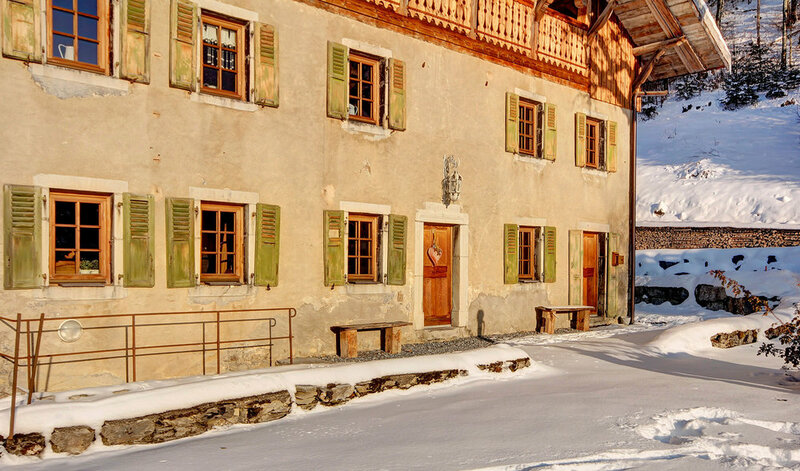 A beautiful 19th Century Savoyard farmhouse - built in 1842, restored in 2010 and situated in the village of Montriond. This stunning building was lovingly restored by owners Lucy and Rob in 2010. With the help of local artisans and Lucy’s eye for interior design, they have created an utterly unique and luxurious getaway perfect for ski holidays, special events and weddings in the Alps all year round. One of the most unique hotel / ski chalets in the French Alps. Morzine is the premier location for a wedding in the alps. Experience mountain paradise in our boutique hotel / ski chalet in Morzine, French Alps. We offer 14 en-suite bedrooms across the main house, our sister chalet La Petite Ferme and ground floor apartment. The rooms are exceptionally spacious and designed in a fusion of contemporary and antique styles. Outdoor hot tub on our sun terrace. 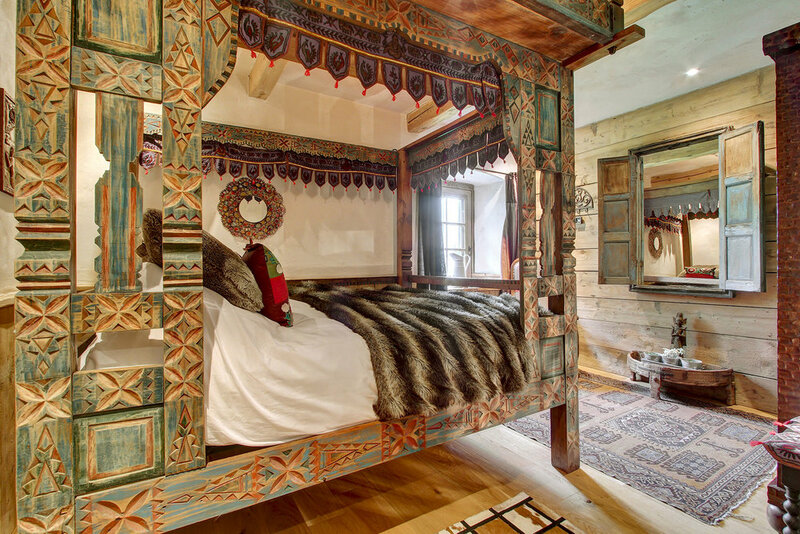 One of many beautiful rooms in our boutique hotel in Morzine. Our stunning farmhouse overlooks the beautiful Alpine resorts of Montriond and Morzine. Situated in the heart of Montriond, our luxury chalet is a stone's throw from Morzine and Avoriaz. Morzine boast's a prime location as one of the largest & closest ski resorts to Geneva, with a one hour airport transfer. We take great pride in providing comfort for our guests with rooms designed in a fusion of contemporary and antique styles. Enjoy boutique hotel comfort in our luxury Alpine hotel & ski chalet. Inside our boutique hotel chalet you will find unique spaces such as our beautiful living area with views over the mountains and across Morzine. 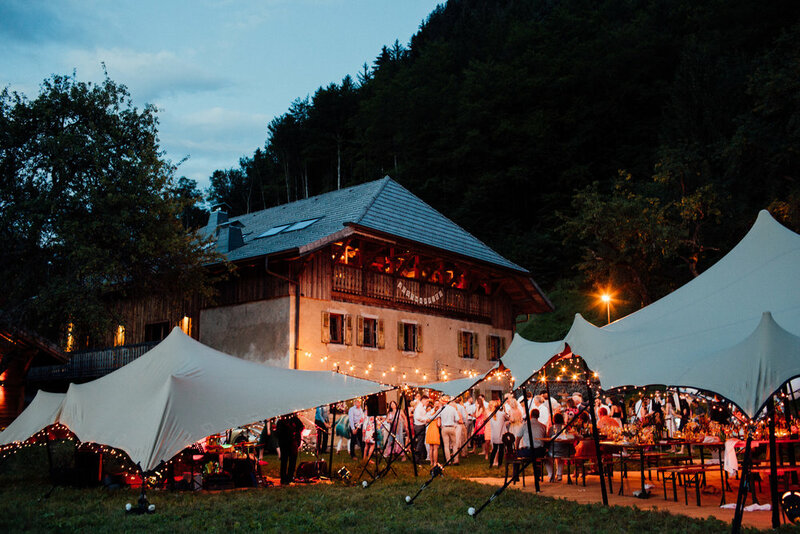 Due to our unique location and rustic charm, we offer the perfect venue for weddings in the Alps. We're very honoured to work with some of the most innovative brands in the world. Whether it's providing our guests with top-notch skincare products or our luxury transport experience. Check out some of the brands we work with and read what the press have to say about us. Award winning natural bath & body products containing the very best organic, wildcrafted and fairly-traded plant extracts and essential oils. By prior arrangement with Lexus the possibility to view & test drive luxury, the ultimate in style and comfort high-end Lexus and Toyota vehicles. Proud to be featured as one of the most ‘Extraordinary Places To Stay’ by Lonely Planet in association with British Airways. We are one of the top five best mountain lodges to stay in Europe according to The Guardian. Read the full article on our blog. We promise we won't bombard you or share your details with anyone else. We'll just keep you up to date with stuff we think you'll be interested in.